The 4859 InfoPrint 1988 multifunction printer from InfoPrint Solutions Company, a Ricoh-IBM joint venture, is being introduced to enhancing its workgroup printer family. This printer is the replacement for the InfoPrint 1580 MFP. The 4859 InfoPrint 1988 MFP printer model T01 includes two 500-sheet drawers, two 1,000-sheet drawers and a 100-sheet multipurpose feeder (MFP) for a total input capacity of 3,100 sheets standard. One optional input source is supported for a total maximum input capacity of 5,100 sheets. Standard output capacity is 500 sheets with a maximum output capacity of 3,800 sheets. The t01 model includes two 500-sheet drawers, two 1,000-sheet drawers and a 100-sheet multipurpose feeder (MFP) for a total input capacity of 3,100 sheets standard. One optional input source is supported for a total maximum input capacity of 5,100 sheets. Standard output capacity is 500 sheets with a maximum output capacity of 3,800 sheets. All models have one slot for additional SDRAM memory. Memory options for the printer include 256 MB, 512 MB, or 1024 MB memory DIMMs. All models have one slot for the optional 256 MB flash memory card. An 80 GB hard drive comes standard. The maximum monthly usage for the InfoPrint 1988 MFP is 300,000 impressions. InfoPrint Solutions Company does not recommend printing to the monthly maximum on a consistent basis. Note: (2) The 2400 Image Quality (IQ) enhancement is a special print mode designed to vary the intensity of each individual printed dot by manipulating its size to produce the appearance of greater print resolution within the limitation of a set number of dots per inch (dpi). The toner darkness setting offers 10 user-selectable settings to balance print darkness and toner savings. The higher the setting, the darker the print (that is, level 1 is the lightest). The printers ship with a default setting of 8. Level 8 to level 1 offers up to 50% toner savings, thus reducing the cost of printing. The toner darkness setting is available through the operator panel under the Quality menu and also accessible from the print driver. Note: Due to limitations of the printing technology, setting 9 and 10 do not provide darker print than the default setting of 8. The fonts in the PCL emulation are compatible with the fonts in the HP LaserJet 4550, and include nine additional fonts and many extra symbol sets to support extra languages and applications. Included in the PCL emulation are OCR-A, OCR-B, and Code 3 of 9 barcode fonts. The fonts in the PostScript emulation are compatible with all 136 fonts in Adobe PostScript 3 and include 22 additional fonts. The CD-ROM shipped with the printer includes screen fonts to match the printer's resident scalable fonts. The Software and Documentation CD also contains a variety of downloadable fonts for Hebrew and Arabic. The InfoPrint 1988 MFP time to first print are shown in the following table. The InfoPrint 1988 MFP printable area is limited to within 4.0 mm (0.16 in.) of top, bottom, left or right edges of the media. Any information placed outside this specified printable area will not print. The t01 model includes two 500-sheet drawers, two 1000-sheet drawers and a 100-sheet multipurpose feeder (MFP) for a total input capacity of 3,100 sheets standard. One optional input source is supported for a total maximum input capacity of 5,100 sheets. Standard output capacity is 500 sheets with a maximum output capacity of 3,800 sheets. The 002 model includes two 500-sheet drawers and a 100-sheet multipurpose feeder (MFP) for a total input capacity of 1,100 sheets standard. Up to two optional input sources are supported for a total maximum input capacity of 5,100 sheets. Standard output capacity is 500 sheets with a maximum output capacity of 3,800 sheets. See table below for standard and maximum media capacities. Note: (2) The 2000-sheet dual input is standard on t01 model. Note: (1) Supports only one 120 gsm cover sheet. Remaining sheets are limited to 64-90 gsm. Note: (2) Supports only one 32 lb cover sheet. Remaining sheets are limited to 17-24 lb. Std. bin 1  bin 2  fin. Due to the InfoPrint 1988 MFP print technology, paper designed for use with xerographic copiers should provide satisfactory print quality and feed reliability. Other types of supplies may be suitable. It is recommended that users test any particular brand for suitability to their applications. Refer to the User's Guide for additional media specifications. Nine-inch diagonal color LCD touchscreen. The numeric pad consists of numbers, a pound (#) sign, and a backspace button. The "5" button has surrounding bumps for non-visual orientation. Direct USB connectivity allows individuals to print files directly to the printer using an approved USB flash memory device. Through the printer's USB Direct interface on the printer's operator panel, a user can simply insert the USB flash memory device, select the appropriate file and or select the USB flash memory device as a scan destination. The following table summarizes scan performance. Note: TTFS = Total time to first scan: times will vary based on file size. Incoming faxes may be forwarded to another fax machine, e-mail, FTP, LDSS, or eSF. In order to fax to LDSS, LDSS is required. Maximum Broadcast locations is 400. Note: Each number in a group fax is a location. Note: (1) Loading paper in the RADF or Flatbed or touching the MFP display will activate warm-up of the MFP and could lower this time to first copy. Time to First Copy/or First Copy Out Time (TTFC or FCOT) - Regardless of using the Flatbed or the ADF this is the amount of time from pressing the Copy button until the preprinted copy sheet lands in the output bin. Negative Image, Mirror Image, Background Removal, Sharpness, Shadow Detail, Auto Center etc. is the size of the hard drive less 1 GB. fax storage size on flash is 18 MB. The InfoPrint 1988 MFP printer complys with the global safety standard for Information Technology Equipment, IEC 60950, and its country equivalents in the markets we serve. The following sections highlight the approvals and certifications that printer is expected to receive. These printers/MFPs contain several standard and optional features and functions that improve or enhance the security of the device. See User Guide for more information. This subsystem provides a centralized method for user authentication and authorization when trying to access protected functions or settings. It supports several types of user credentials including internal accounts, NTLM, Kerberos 5, LDAP, LDAP + GSSAPI, passwords and PINs. Access controls can be used to protect or disable various functions (i.e. copy, email, and fax) on the device. Access controls can be modified through settings from the operator panel or through the embedded web server. Users can also disable unneeded protocols and network communication paths by which the MFP can be configured. The security audit log monitors the device's operations and records security-related events and security-related settings changes. Supports industry-standard syslog. The MFP touch screen lock function disables the MFP functions such as copy and scan-to-e-mail. 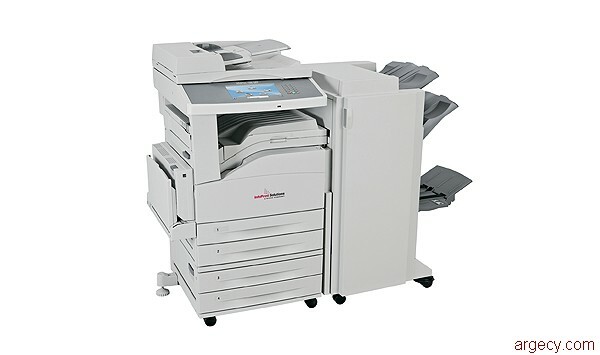 This helps secure the MFP from unauthorized use when the office is idle or unattended. An administrator must enable the function and set the Function Access Control (FAC) template for use with the function. Any authorized user may then lock the MFP touch screen or unlock the touch screen using the required credentials. When locked, every job the MFP receives, will buffer to the hard disk. A user can print jobs, including received faxes, only by entering the correct credentials on the operator panel. Note: This setting is only functional when a hard disk is installed. Note: Back channel data will be processed while the MFP is locked. Reports such as user or event logs can be retrieved from a locked MFP. When a browser is pointed to the MFP's address with the "http://" prefix the MFP and a client system can negotiate an SSL (Secure Sockets Layer) connection. SSL provides encrypted connections to a device's Embedded Web Server via the SSL port (443) instead of the default HTTP port (80). This protects the contents of the session against eavesdropping, and allows for secure remote management of the printer. The hard disk encryption setting gives the device the ability to encrypt all data, buffered and/or stored, on the devices internal hard disk drive. This protects not only residual data left over after jobs, but also protects data actively being used from malicious access at all times. When hard disk drive encryption is activated, an encryption key (256 bit AES symmetric encryption) is pseudo-randomly generated and stored in a proprietary fashion within the MFP and not on the device's hard disk drive. This measure insures the contents of the hard disk drive would remain indecipherable if the hard drive were stolen from the device. Scheduled wipe(1) - Use the EWS or the MFP touch screen to schedule times and the day(s) when a disk wipe will occur. Disk wiping can be enabled from the MFP touch screen, the Embedded Web Server, or manually through the Power On Configuration Menu. The Restricted Server List lets a system support person restrict which hosts are allowed to communicate with the MFP over the network which prevents other hosts from managing and printing to the MFP. Note: The Restricted Server List only restricts TCP traffic; it does not affect UDP traffic. The Restricted Server List supports up to ten host addresses or ten network addresses. Upgraded firmware files from InfoPrint Solutions Company are now signed with a digital signature, which verifies the source and authenticity of the updated code. This prevents a malicious user from creating and uploading to the MFP custom code that could intercept and expose potential confidential data. To maximize the user experience, InfoPrint Solutions Company offers system PCL emulation and PostScript emulation drivers for Windows systems. Built on Microsoft technology, these customized system drivers for Windows provide the most comprehensive set of printing features available for InfoPrint Solutions Company products. Offering an easy-to- use interface and time saving preset features, the InfoPrint Solutions Company drivers allow users to access popular features intuitively, while utilizing Microsoft's rendering engine to provide a solid printing experience. InfoPrint Solutions Company Status Messenger replaces the prior status window. Printer drivers are provided on the Drivers and Utilities CD that is packaged with the printer. See PublicTIFF - 1 bit - CCITT G4 8/24 bit - Packbits, LZW ations section for details. Note: (1) Download the latest MFP drivers from the InfoPrint Web Site. Note: (3) MFP driver support only. No support for InfoPrint utilities. Driver must be installed using Windows Add Printer Wizard. Note: (10) No scan support is available. Note: (3) Lowering MPF tray adds 210 mm (8.3 in), lowered and fully extended adds 330 mm (13.0 in). The following table specifies nominal average power requirements for the base printer configuration for InfoPrint 1988 MFP. The InfoPrint 1988 MFP has one slot for additional memory DIMMs and one slot for flash memory cards. The following font cards plug into the flash memory slot. There are two firmware/font card and flash memory slots. One firmware/font card and one flash memory card are supported. Each may be installed in either location. This plugs into the fax card slot and provides fax capability for the MFP. These features plug into the firmware card and flash memory card slots.